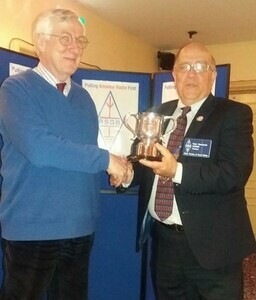 Our very own Alwyn Seeds, G8DOH receives the Courtenay-Price trophy at the RSGB AGM for the most outstanding technical contribution to amateur radio in 2016. This was made for his article on VHF Contest Systems which was printed in Radcom and also given as a talk both at the RSGB Convention and of course more recently at Hut 18. He has of course put theory into practice and has built the majority of the CARC / RATS contest system. If you want to operate an award winning contest station do come along to Swingate (near Dover) on the weekend of 20/21 May. See the events page for more details.